There’s nothing like a light and buttery homemade pie crust to perfect a pie. Don’t be intimidated to make your own! It seems like a lot of steps, but it’s really very easy to master. Once you do, you might even make your own more often than buying pre-made crusts. Gather all your tools and ingredients and let’s start rolling! These instructions are also available in a Homemade Pie Crust Recipe. Flour, liquid (water or milk), salt and fat (butter, shortening or lard) are the key ingredients in a standard pie crust. Flour forms the structure, liquid binds the dough, fat provides flavor and flaky texture, and salt improves the flavor and makes the crust golden. Some swear shortening makes a lighter pie crust, but some prefer the taste of butter. For the best of both worlds you can always use half butter and half shortening. You can also use lard as your fat. These ingredients are for one pie with two crusts, or two open face pies: 2 ½ cups of white all-purpose flour, 1 cup butter or shortening, 1 teaspoon salt and about ½ cup cold water. You will also need a pie pan and a rolling pin. Pie pans can be metal, glass or ceramic. There is a bit of a debate among pie makers over which type of pan makes the best crust but in the end it is up to personal preference. Chill the butter and liquid in the freezer. Chilling prevents the flour and butter from forming a creamy consistency, rather than the crumbly consistency you need for pie dough. Combine flour, salt and chilled butter with your hands, a dough blender or with a food processor in a large bowl. Blend the mixture until it is crumbled into pieces about the size of small peas. Pour chilled water into the mix and gently knead the dough into a ball. As soon as it’s ‘ball shaped’ – stop. You don’t want to overwork the dough or it will become hard! Remove the dough from the bowl and divide it into two portions. Slightly flatten each portion, wrap them in a plastic wrap and refrigerate the dough for 30 minutes. This will make the dough more elastic and will give the crust a better texture when baked. Remove one portion of the dough from the refrigerator and let it sit at room temperature for 5 to 10 minutes. Remove the plastic wrap and place it on a dry, clean surface dusted with flour. Slightly flatten with your hands and begin to roll with the rolling pin to a ¼ inch thick circle. The dough circle should be wide enough to overlap your pie pan. Note: You can purchase rolling mats in most kitchen accessory or department stores that provide guides to fit various sized pie plates. They aren’t expensive and are a big help to the novice pie maker! Carefully pick up the rolled out dough and place it in the pie pan. Gently press the pastry into the pan and trim off excess with a knife. You can pinch the dough edges for an attractive finish. Refrigerate the crust for 20 minutes. If you are pre-baking the pie crust, prick with a fork – being careful not to prick through to the pan. Then bake according to directions. If making a two-crust pie, load with the filling of your choice. Roll out the top part of the crust the same way as the bottom. Gently place over the filling, trim the excess and pinch around the edges. Score with a knife to allow heat to escape during baking. Don’t cut all the way through to the bottom of the pan! Make a lattice top by cutting strips of pie crust and weaving them over the top of the pie. How did your crust turn out? Was it chewy or soggy? Were the edges burned? Chewy or tough pie crust indicates the dough was handled too much, typically when it was being kneaded and formed into a ball. If the bottom of your pie is moist, the oven temperature was too low. Try increasing it by 15 or 20 degrees next time. You can place tin foil over the edges of the crust to keep it from burning before the center of the pie is cooked through. My favorite pie crust secret? Vodka! Use some chilled vodka instead of chilled water, either the full ½ cup or half and half. The alcohol evaporates in the oven, giving the pie crust a better texture. 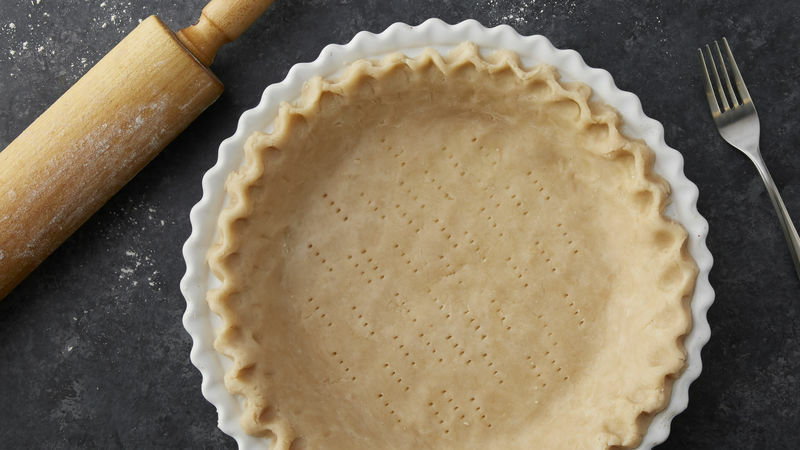 What’s your secret to the perfect pie crust? Share your ideas below!